Published on January 6, 2012 in General T&T, Hindu, India, Politics, Race and Identity and Racism Watch. 42 Comments Tags: Basdeo Panday, Caste System, Dr. Manmohan Singh, Kamla Persad-Bissessar, Stephen Kangal. Our Prime Minister the Hon Kamla P. Bissessar is paying an Official State Visit to India, her ancestral homeland at the latter’s invitation after an interregnum of 15 years, Basdeo Panday being the last to do so. She is also the Chief Guest of the Prime Minister of India, Dr. Manmohan Singh at the Annual Pravasi Bharatiya Divas to be held in Jaipur from the 7 to 9 January. The PM is accompanied on this official state visit by seven Government Ministers and a public-private sector entourage numbering in excess of 100 participants. Published on January 4, 2012 in General T&T, PNM and Politics. 11 Comments Tags: Keith Rowley, Parliament, Politics, Selwyn R. Cudjoe. Some time this month, Linius Rogers’s motion that instructs the male members of PNM to wear their balisier ties in Parliament, municipal and city bodies and at official functions will come up at the PNM General Council for a discussion and a vote. As a member of the PNM, I support this motion unreservedly because it is a way to keep us true to our roots and a sign that we are a distinct political formation in Trinidad and Tobago. Published on January 1, 2012 in General T&T, People's Partnership, PNM, Politics and UNC. 13 Comments Tags: Basdeo Panday, House Speaker, Kamla Persad-Bissessar, Patrick Manning, Politics, Raffique Shah, T&T Govt, Wade Mark. A FEW weeks ago, Dr Brinsley Samaroo telephoned me. After we exchanged pleasantries, he got down to stating the purpose of his call. 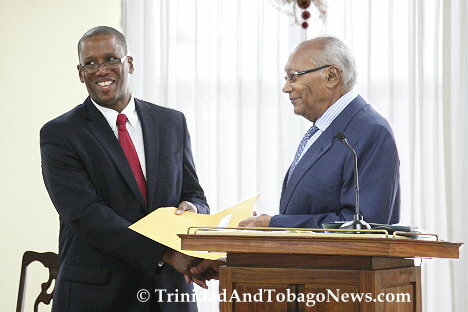 House Speaker Wade Mark had asked him to make contact with a number of ex-parliamentarians whom he (Mark) wanted to recognise for their service to Parliament, and, presumably, to country. Brinsley informed me that I was among those selected, and he wanted to inform me and to gather some biographical data from me.